Disney princesses reimagined as hot dogs and drunken rants by name-brand chefs are de rigueur for quarterly food magazine Lucky Peach. But a new cookbook from the journal’s editors leaves most of that on the table, favoring instead a just-campy-enough approach to Asian home cooking. Launched in 2011 by New York food writer Peter Meehan and Momofuku chef David Chang, Lucky Peach combines award-winning long-form journalism with that special brand of hipness designed to make outsiders know where they stand. The cookbook from the self-proclaimed “cult” food magazine has some of that — the chapter introduction mentions a staff Bacchanalia on Richard Branson’s private island — but also goes a long way to making you a master of easy Asian cooking. 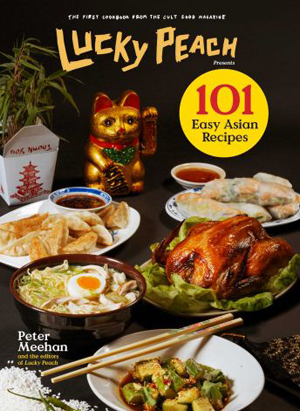 Delicious, straightforward recipes for items such as shrimp-and-chive dumplings and the Japanese pancake called okonomiyaki fill “Lucky Peach: 101 Easy Asian Recipes,” along with romping commentary that makes the book fun to read as well as to cook from. We talked with Meehan about the book, the magazine and the future of Asian cuisine in America. AP: In 2011, with big magazines such as Gourmet out of business, you and David Chang founded Lucky Peach. Remind readers of the thought process there. Peter Meehan: It seemed like a good idea at the time, for purely creative reasons. I was a writer and I had stories I wanted to write that I couldn’t place. As a chef, there were only certain things people wanted Dave to do. They wanted the bear to dance. For him, it was so he didn’t have to be the dancing bear. And for me, so I didn’t have to write the story about how the bear danced. We were young and full of ideas and we didn’t think about the potential for success. We just thought about doing it. I hate to short-sell us, but we were in the right place at the right time and it hit a chord. AP: What do you think that chord was? Meehan: It’s so hard to say things without feeling incredibly self-congratulatory. But I think there was an honesty and a directness, a transparency. We didn’t make another lifestyle magazine, we wrote about our lives. Once that first issue was a success it gave us an opportunity to expand the conversation around food, and to let writers write at the length they needed to tell their stories, and to showcase what chefs were passionate about outside of seasonal roundups and easy recipes. AP: How has Lucky Peach evolved since then? Meehan: We curse less. I prided myself on publishing unpublishable recipes that were either difficult and authentic or represented how the greatest chefs in the world cooked. And then over time, I think out of personal interest and because we felt like we’d proved our point, we’ve moved into a more approachable and usable set of recipes because we see the value in those. AP: Who’s reading and why? Meehan: We have a pretty huge audience of cooks and chefs. We finally did some audience research. And we found there is a huge audience of people who cook at home, who eat out a lot, who are in their late 20s to early 40s. I think guiltily that we write the magazine we want to see. And that’s the constituency I’m most concerned about — making a magazine I don’t hate. And then it’s always comforting when people want to come on that ride. We print 100,000 copies and distribute all of them. We’re big for a little magazine. AP: Did the magazine push the envelope more on journalism or on food? Meehan: It’s hard for me to be the person answering that question. If we pushed either of those conversations at all, then I feel great about it, because those are my passions and my profession. But I think it’s great to see other magazine stories getting longer, their curiosity about cuisines getting more diversified. If we’re helping move either of those bars forward, that’s an enormous success. AP: Early on, you prided yourself on difficult recipes. Why this book, why these very approachable recipes? Meehan: This felt like unexplored territory for Lucky Peach. For as much as I love and have a bookshelf full of nostalgic Oriental cookbooks from the `70s, they’re useless. And they’re bad. The food from them doesn’t taste good. So bringing what I know and what we know collectively about Asian cuisine, I feel like it was a useful, timely cookbook. Many of these recipes are things my wife and I have made at home for years. AP: You’ve got so many classics in here: cumin lamb, scallion pancake, sticky rice in lotus leaves. You could do a whole dim sum at home. What’s your favorite recipe? Meehan: I ate the entire portion of cumin lamb pictured there. Which was very gross, but very delicious. Miso claypot chicken, no claypot. Now I add a couple of Chinese sausages to it. We eat it twice a week and the kids eat it. Then there’s a “Chineasy” cucumber salad in the front of the book that uses black vinegar, and that’s a really exciting, cool, eye-opening ingredient that you can order from Amazon and totally change your cucumber salad game. Which is a sad, small statement, but if you cook at home, it’s an exciting trick. AP: The inaugural issue of Lucky Peach was about ramen. You’ve also done Chinatown. Describe the evolution of the magazine’s relationship with Asian food and how it’s reflected in the book. Meehan: In the magazine, we want depth. One of the qualifications I look for in a Lucky Peach story is: Is this person inside the story? Can they tell it in a way that would feel authentic to a person who knows it intrinsically? I think that that’s the measure of the better stories we do about Asian cuisine and food culture in Asia. In most of (the recipes), the home cooking shortcuts are the ones they take in Asia. Everyone there has jobs and computers and deadlines. There are some campy twists and turns in the book because they’re fun, but we’re trying to honestly represent how this food is made in a home cooking setting. AP: What place does Asian food occupy in American culture today? How far beyond Chinese have we gone? In a wide, deep saute pan or a 3-quart saucepan over medium, heat 1 tablespoon of the oil. Add the onions and cook, stirring and folding, until the onions are light golden but still retain their shape, about 15 minutes. Scoop the onions onto a plate and wipe out the skillet with a towel. Heat the remaining 1 tablespoon oil in the pan over medium-high, then add the ground pork and cook, breaking the meat into small pieces with a spoon, until just cooked through, about 8 minutes. Push the meat to one side of the pan and add the garlic to the pork drippings. Sweat until fragrant, 1 to 2 minutes, then remove from the heat. Stir in the gochujang, peppercorns, chili flakes, soy sauce, sugar, water and reserved onions. Season with salt. At this point, the sauce may be refrigerated or frozen. Reheat before proceeding. Bring the sauce to a simmer over medium heat and stir in the bok choy. Cook, stirring occasionally, until the stems are just tender, 3 to 5 minutes. Serve over noodles or rice, sprinkled with scallions. Nutrition information per serving: 470 calories; 280 calories from fat (60 percent of total calories); 31 g fat (9 g saturated; 0 g trans fats); 105 mg cholesterol; 620 mg sodium; 17 g carbohydrate; 2 g fiber; 9 g sugar; 32 g protein.